This delicious seitan dish was created by Dilip Barman, head of the Triangle Vegetarian Society in North Carolina, and host of the largest annual vegan Thanksgiving feast in the USA with over 800 attendees. For more information, see www.trianglevegsociety.org and www.dilipdinner.blogspot.com. Photographs by Linda Long from Virgin Vegan: The Meatless Guide to Pleasing Your Palate* by Linda Long, reprint permission by Gibbs Smith Publisher, 2013. Combine all marinade ingredients in a bowl and allow to set 2–3 hours or overnight in the refrigerator. Mix spices for jerk in a small bowl and set aside. Add olive oil to large skillet and heat over medium-high heat. Drain marinade and sauté seitan in a single layer for 4–5 minutes, or until light brown on all sides. Add diced kale stems and cook about 1 minute. Add onion and sauté until caramelized. 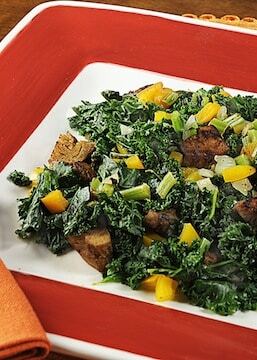 Add bell pepper and kale leaves and cook an additional 1–2 minutes. Mix in jerk seasonings, blending well.